In order to achieve its purpose, the Trustee Council chartered the Technical Staff. The Technical Staff provides technical expertise to the Trustee Council, and the Trustee Council provides oversight and guidance to the Technical Staff. 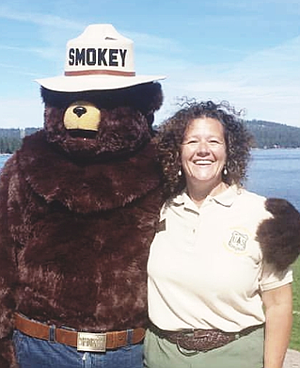 Pierson is an avid botanist who began her Forest Service career as a seasonal botanist on the Payette National Forest in 1992. She completed a Bachelor’s Degree in Biology and a Master’s Degree in Botany/Ecology at Utah State University in 1999. Prior to starting her permanent Forest Service career, Pierson successfully managed her own botanical consulting company which was highly utilized by several National Forests to complete survey work, pollination studies, and botanical analysis for Forest Plan Revision efforts. Pierson was the Forest Botanist for the Sawtooth National Forest. She spent nine incredible years in this position working on a variety of botanical issues and restoration efforts. Pierson became the New Meadows District Ranger in 2010, and then served as the Acting Director for Natural Resources for the Intermountain Region in 2015. She leads a highly performing workforce comprised of a dedicated team focusing on increasing the pace of restoration under Collaborative Forest Landscape Restoration Program and a large fire organization. Pierson and her husband Jeff Motychak share a love for camping, canoeing, science, and adventure. Jeff and Kim also have a soft spot for shelter animals and have provided a home for five dogs and two cats, which are the light of their lives. They are all extremely excited to be coming to the Idaho Panhandle National Forests. Born and raised on Long Island, New York, Mr. Cernera was educated at the University of Idaho. In 1982, Mr. Cernera started his formal career as a Fisheries Scientist working on Russian and Japanese Fishing boats in the Bering Sea. Now back on dry land he has since worked as an environmental specialist in Indian Country for over 30 years. For the last 20 years Mr. Cernera has worked for the Coeur d’Alene Tribe and is now Director of the Tribe’s Lake Management Department. The programs he administers include: Recreation Management, Shoreline Protection, Water Resources Management, and Hazardous Waste Management. Mr. Cernera also has been appointed by the Tribal Council to sit on the Basin Environmental Improvement Project Commission that oversees the implementation of a multibillion dollar EPA superfund remedy. Phillip is a Trustee on a NRDA Council that will implement over 150 million dollars in restoration, and has recently been placed on the National Tribal Water Council. Chip Corsi has worked for the Idaho Department of Fish and Game in a number of positions for over 32 years, the last ten as the Regional Supervisor of the Panhandle Region, based in Coeur d’Alene. Prior to that he has worked in fisheries management and research, as well fish and wildlife habitat conservation, and has over 20 years of experience working in the Coeur d’Alene basin. He has a BS in Fisheries Management from the University of Idaho, and an MS in Zoology from Idaho State University. Professionally, he takes his greatest satisfaction from working collaboratively with stakeholders from the public, other agencies, and industry to find solutions to natural resource challenges, and generally making our part of the world better for fish, wildlife, and people. He has been married for over 30 years to his wife (a native of Coeur d’Alene) and has two grown children and a daughter-in-law, and a grandson (6th generation Idahoan), all of whom recreate in and enjoy the Coeur d’Alene Basin for its natural wonders and great people.